Recently molecular targeted drugs have been introduced in the management of neuroendocrine tumours (NETs). 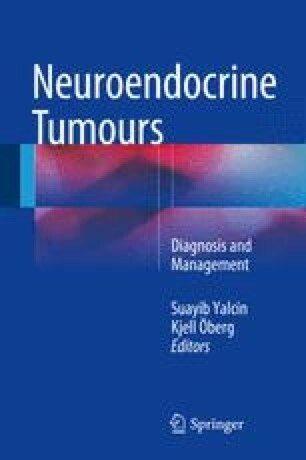 While in pancreatic NET the mammalian target of rapamycin (mTOR) inhibitor, everolimus, and the multiple tyrosine kinase inhibitor, sunitinib, have been approved in progressive disease based on prolongation of progression-free survival in large placebo-controlled trials, the role of targeted drugs is currently less clear for NET of other primary tumour origins. Many more targeted drugs, such as inhibitors of vascular endothelial growth factor (VEGF), insulin-like growth factor 1 (IGF-1) and epidermal growth factor (EGF) receptor signalling, have been explored as single drugs or in combination with other drugs, such as chemotherapeutics or somatostatin analogues. Since objective remissions are rare with targeted drugs and stabilisation of disease and minor tumour shrinkage is not an uncommon finding with best supportive care in patients with NET, the value of these targeted drugs needs to be elucidated in well-designed prospective comparative trials in distinct types of NET.